CVS Nursing is proud to announce an exciting new partnership with the Royal Veterinary College, University London to deliver accredited CPD for nurses. CVS Director of Nursing Belinda Andrews-Jones has worked with the Royal Veterinary College (RVC) to develop a new “Nursing Excellence Course”. This new course will provide access to the fantastic clinical nursing modular CPD, run by the RVC. This will provide an accredited certificate in a particular subject area. These modules are run entirely online over six weeks and use a mixed delivery deep learning approach to deliver high quality content, which encourages learners to think critically about their work, not to just engage in box-ticking CPD hours. Within the course there are multiple exciting and enlightening subjects to choose from and we will be adding more subjects as the program develops. 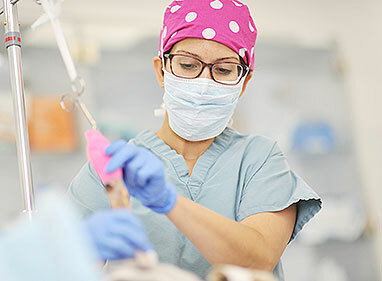 At the end of the module, nurses will gain up to 18 CPD hours, and a certificate from the University of London, Royal Veterinary College, London. Belinda Andrews-Jones commented: “At CVS we are committed to developing our people and believe that their progression should be at the heart of our organisation. Nurses play an integral part of delivering high clinical standards to our patients and as such, we believe the creation of the Nursing Excellence Course in partnership with Royal Veterinary College, University of London will deliver just that. The uptake of this course has been phenomenal! The feedback so far from nurses and practices has been extremely positive which is fabulous! Adele Duckworth RVN who participated in the first RVC/CVS Nursing Excellence Course in anaesthesia and analgesia writes: “I found this course refreshed my knowledge in some areas but also made me think about other techniques of anaesthesia. Each week a new area was released in the module, which was building in depth. I really liked the mixedapproach that included short quizzes, case studies examples to discuss within a forum, presentations, videos and some things to use in practice and send in. When I had a question, I sent it into the course tutor and I was responded to within one day with my query, which was great! I really loved the course and look forward to another one”. CVS has been proactively developing its learning and development programme and has recently announced the appointment of a new Director of Veterinary Education Prof Renate Weller has joined CVS from RVC and will be part of CVS’s commitment to continued learning and excellence.